Virtually no model on the face of the earth that has not passed through the hands of a creator based on ingenuity and patience has used its base to achieve a completely different design. The Kawasaki Ninja 250 would be less. Handyman, patience and 1,245 euros is what it takes to transform a sporty low engine as the Kawasaki Ninja 250 in a “cucumber” Street Fighter ready to attract everyone’s attention. 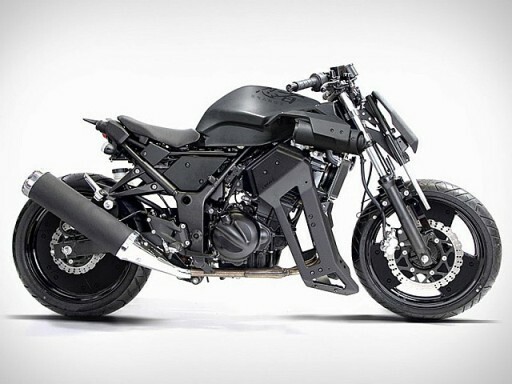 U.S. company Brasse, has released a kit by which completely change the aesthetics and the concept of “ninjita” to give a much more urban and also dark air. Based on removing parts of the Ninja 250 and implement the facilitated by Brasse, gets have a real 31BLK. Best of all is do not need any mechanical modification, it is a kit of “plug and play”. The fact is that a handful of extra dollars you can have two very different bikes as aesthetics are concerned, but not touch the soul of the bike. In the pack that Brasse available to the public in the basic price includes everything that can be seen in the design, except the carrier plate, the lower fairings and passenger seat, which can be purchased separately.